When I came to Colombia in 2009, I arrived feeling that I had a pretty solid grip on Spanish. Oh sure, there were words I didn’t know, but I was certain that all my years of learning Spanish in school would be enough to confer me high intermediate or even low advanced status. After all, I’d always been the best student in my classes, my accent was decent (as if that has anything to do with anything! ), and, most importantly, I considered my Spanish to be impressive, and so did other learners. Wasn’t that enough? How sadly wrong I was. The fact was I was seriously deficient in actual interaction with native speakers. This meant two things: 1) I could barely speak in a way that came even close to sounding natural, and 2) My ability to understand native speakers was even more abysmal. My inflated self-confidence took a nosedive. I had no choice but to admit my mediocrity and basically start over from scratch. It ended up being one of the best decisions I ever made, though. I’m the first to admit that I still have a long ways to go; I’m also not hesitant to dip into the mortification of those early days if it can be of use to other learners–not that I would want to deprive you of your own funny stories and necessary blows to the ego! Today’s word marked one of those crushing moments when reality began to sink in. One of those words that hammered in the depressing verdict that maybe I wasn’t such a Spanish hotshot after all. Maybe my Spanish sucked. Now what? It was my first weekend in Colombia, and I was at the house of some relatives of the family I was living with. Both physically and mentally exhausted, I had been resting on the couch in a room with the TV news blathering on about I-had-no-idea-what. An uncle, Orlando, walked in, jovial as ever, and said something to the effect of, ¿Qué más, mi niña? ¿Juiciosa? WHAT? The meaningless syllables mercilessly ricocheted on my brain only to indicate that I had nothing. We went back and forth like that several times, engaged in a pitiful volley as I awaited enlightenment that never came. Later that night, I turned to the dictionary for guidance. Now, even though Orlando had said juiciosa to me probably seven or eight times, saying it slowly and even yelling it, my listening comprehension in those days was so bad that I still didn’t even hear the word right. I thought he had said something like quisquillosa. The dictionary told me that meant fussy or picky. What in the world? Surely that wasn’t what he had said to me. It wasn’t. With time plus many other occasions to hear the word again, I came to realize that he had been saying juiciosa, NOT asking me if I was picky. The dictionary will tell you that juicioso means judicious. 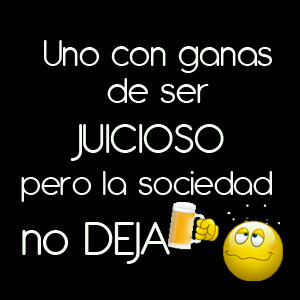 In Colombia, however, juicioso is used to mean hardworking, well-behaved, and responsible. As you can imagine, it’s often used to tell children to be good (Niños, sean juiciosos or Ojo, pues, mucho juicio) or to describe someone’s work ethic. It’s also frequently used in a less straightforward way to ask if someone’s been working hard recently or been a “good boy” or “good girl,” i.e., staying out of trouble. ¿Qué más? ¿Cómo te ha ido? ¿Juiciosa?– Ah, pues, bien, gracias a Dios. Sí, claro, muy juiciosa en mis estudios. How’s it going? What have you been up to lately? Staying out of trouble?–Oh, you know. Pretty good. Busy with school stuff. ¿Así que al fin no fuiste a la fiesta?– No, me quedé en casa cuidando a mis hermanos.– Ah, ¡tan juicioso! So, you didn’t end up going to the party?–No, I stayed home to babysit my little brothers.–Well, aren’t you responsible! I consider it a sort of muletilla, one of those filler words that doesn’t mean very much at all. Are your friends really interested in checking to make sure you haven’t been up to mischief? Would anyone ever confess to not being juicioso lately? The asker is looking for a yes, so make sure you give them one, simultaneously confirming for them why they think so highly of you. A win-win. Ojo: As previously noted, although it would make the word more fun, juicioso has nothing to do with juicy bears, disappointingly. __________________________________________________ Non-natives, what’s your experience with this word? Had you heard it before? How have you heard it used? Where? If you’re a native Spanish speaker, anything to correct, clarify, comment on or concur with? This entry was posted in Describing People, Greetings, Informal and tagged Language, Spanish. Bookmark the permalink. Yeah, I guess that first contact (or actually, first one hunded interactions) with native speakers is always a shock. This reminds me of an anecdote one of my English teachers told us. He was a student of English at a uni and went to Great Britain for a trip. One day he wanted to but a packet of cigarettes but he was rather shocked when he realised that he couldn’t understand what the shop assistant was saying to him. The message only became clear to him, when an elderly lady repeated the phrase using more standard pronounciation that he was fimilar with. Oh, and by the way- you also answered a question I wanted to ask you but never did (namely, whether you had studied Spanish before going to Columbia). It is a shock! I think it’s even more of a shock when people don’t understand you and you know that you 1) are using real words that definitely do exist and that the native speakers certainly know, and 2) you know that your accent is “good.” What’s the problem? Why does everybody pretend you’re talking gibberish? I haven’t solved this mystery 100%, but I think there is a lot to say about speaking naturally. When you’ve learned a language in classroom via textbooks, you tend to talk in a highly academic and robotic way that just does not elicit much comprehension. Maybe people recognize the words, but they don’t come together in a way that makes it at all clear just what it is that you want to say. Not to defend myself, but I do think it bears pointing out that most people are poor listeners, though. If the things a foreigner says don’t roll out in the standard, prepackaged forms and order that a native speaker is used to (and thus, expects) so that their brain can passively absorb the information without having to make the effort to analyze it, it’s like the words just bounce off them. This can be extremely frustrating and disheartening for a learner, and many just give up. Yes, I had many years of Spanish under my belt. The main thing I took away from all those years in class was a very good grasp of grammar. And… that’s about it! Great word imagery with your posts! Juicyoso is definitely an untapped candy just waiting to be sold. Great description of this very colombian word. I’m terrible with the use of juicioso… maybe because I find the sometimes English equivalent “keeping busy” a pretty boring response. I just stumbled onto your website via a friend but I’ll brush up on some of my own language cracks. Btw, do you have a breakdown of the ‘gracias a dios’ concept? Thanks so much for the enthusiastic and kind words. LOL– yes, Juicyoso would have some great marketing already built in. Sure, I can do gracias a Dios. Thanks for the idea. Just curious, on what friend’s site did you find me? This blog is so new that I haven’t made much of a footprint yet on the internet, but I definitely hope to get the word out. Glad you found me. Cool, thanks. Have no idea who he is, but that’s the internet for you! We all get connected one way or another. Great post – really well written. I have recently learnt “juicioso”, as my girlfriend is Colombian and I’m learning Spanish. Thanks for the examples. I also heartily agree with “most people are poor listeners”. The timing and rhythm of what you say seem very important, even if everything else is perfect. But in my experience, if you’re are speaking to someone who is also fluent in (or currently learning) English, they are much more likely to understand you. Seems like they can make an effort to listen “harder” as they understand the battle! Thanks a lot for your kind words! It’s an incredibly useful word in Colombia, so I’m happy to hear that I’ve helped you get a handle on it. Hope to see you around the blog more! Cheers. There’s no English translation. But take the noun – juicio (good judgement). And think of an adjective. Also, don’t feel bad about your Spanish. You probably learned a very Mexican Spanish in the US, which is very distinct from all other forms of Spanish. Furthermore, every country has a distinct form of Spanish. Much of what you learned in Colombia will only apply to Colombia. Hi, thanks for the comment. I’m familiar with your blog. You’re very welcome :) Five years! Nice. What do you do there? I’ll see if I can’t write a post on pena. Thanks for your reply. I’m retired but I teach an accelerated, 10 day total immersion English learning program where Professionals, business people, executives and medical doctors can learn Basic, Conversational English in a very intense but short time frame. The program utilizes NLP (Neuro Linguistic Programming) as a methodology to implant “Subliminal Messages” in the subconscious throughout the various lessons. I am continuously amazed at how effective the program is, but it works. An example would be: We teach no English grammar. The grammar is within the recorded lessons and through repetition, the grammar is effortlessly absorbed in the subconscious mind of the clients through repetitive listening of the lessons. That sounds wonderful! Glad you’re enjoying Colombia. Thanks for the post! I hear this all the time in Bogota from my team at work and without the local context one would never be able to get the essence of it. Technically they are my subordinates but I maintain a very informal and friendly relationship with them, and they often ask me if I’m being “juicioso”, :). It took me a while to figure out what they meant. Thank you for putting this info out here!! I too just arrived from Colombia. My parents are from Mexico and there are words that had me confused. This very word! I thought it meant like you mentioned; bear like or husky. I met a beautiful women and she mentioned it thru our emails. I quickly got online and found this page and your experience which is similar to mine. Thank you again.